Last week Mrs H volunteered to drive our elder son and two his school friends to an eighth birthday party. It didn’t seem too much of a challenge, on the face of it: the party was being held within a few minutes’ drive of our house, albeit at an address Mrs H had not visited before. But she had said address, the benefit of verbal directions (“we live in the woods”), and the support of a fully functioning sat nav. What’s more, she had taken the precaution of calling en route at the office of the local estate, from which the house is rented, to make absolutely sure she went to the right one of the two identically named cottages in their possession. What could possibly go wrong? Yes, we’ve all read about the people who have driven into canals, onto railway lines, or got their HGVs irretrievably jammed between two ancient and fragile buildings because “the sat nav told me to do it”, but this is the first time I have encountered this phenomenon quite so close to home. I’m not quite sure I can express my sheer delight/awe/dismay in a word that summarises all of the emotions I felt when I realised the true extent of Mrs H’s predicament. I can say, though, that one of my initial reactions was relief: if only that I am not the only man alive with a wife capable of making such a manoeuvre. When I first got the call to duty (4.15pm) we still had failing daylight. The message was as clear as it was urgent: three 7/8 year olds and a distraught mother stuck in the deepest, darkest depths of the woods, and the mist was closing in fast. All very Hansel and Gretel, actually, come to think of it. On that cheerful note they all, relieved, jumped into the car and we got back to the house so they could be duly terrified by tarantulas and snakes, this being the order of the day apparently. 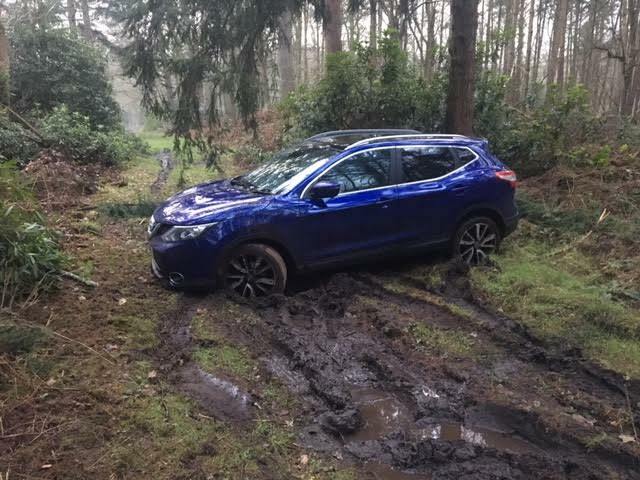 I took the opportunity to steal away from the frivolities of the killer animals in our kitchen to see if I could free the vehicle from the mud……..it not being “badly stuck” etc. 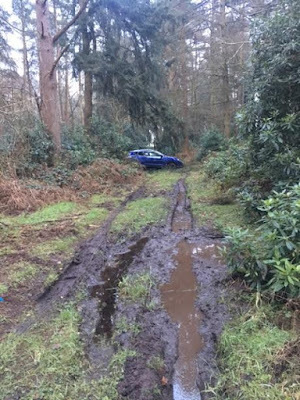 Having picked them up in the woods off a moderately muddy but not impassable path (if you happened to be in a tracked vehicle, that is) I had assumed that where I had been pointed towards to find the stuck vehicle must have been on a similar woodland path. I took myself back towards where I had picked them up, to realise that where the car was actually stuck appeared to be on a track further up into the woods, and not accessible by line of sight……..
Mrs H had in fact decided (because the Sat Nav had dictated) that she turn off what must have been a questionable track in the first place into the woods literally off road. The SAS would have struggled to navigate the course she/the Nav had chosen to take. I have told my wife never again to describe where we live as “in the woods” in case anyone else takes it quite so literally! Brilliant. Simply brilliant. Lifelong comical material. By way of a postscript, over the subsequent weekend one of Mrs H’s front tyres developed what appeared to be a slow puncture. I pumped it up, but it kept losing pressure, so on Monday Mrs H took it to those nice people at the local Kwik Fit. Because obviously, if you did, your first choice of motor would be a two-wheel drive Nissan Qashqai. 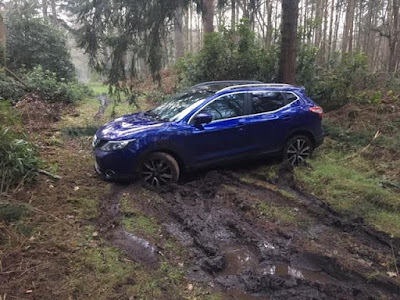 We wanted a four-wheel drive model, as Mrs H had before, but at the time of order Nissan had decided that its customers could have a 4WD Qashqai or an automatic Qashqai, but not both in one car, and the automatic gearbox won. 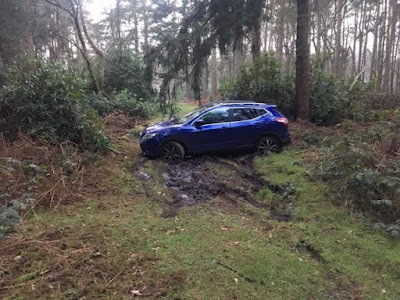 I would say that we had made the wrong choice, but my own car is supposed to be one of the most capable off-road vehicles on the market, and I don’t think it would have fared any better in the circumstances. I am currently on eBay looking for a competitively priced second hand tank. I conclude with many thanks to Mrs H’s rescuers, narrator and photographer, and the assurance that I will, without fail, report here with equal fullness and frankness any car-related misfortunes that may occur when I am behind the wheel myself. How’s that for making myself a hostage to fortune?